The Indian spinners once again penetrated through the strong batting line up of Australia as most of the visiting batsmen struggled to get a few runs on board. The Kangaroos managed 231 runs in 98 overs with two wickets remaining in their first innings at the end of the first day’s play. The fourth and final Test of the series commenced on Friday, March 22, 2013, at Feroz Shah Kotla, Delhi. Earlier, the stand in captain of Australia, Shane Watson, won the toss and got into bat first. The prominent opener, David Warner, was gone without scoring in the second over as Phillip Hughes got together with Ed Cowan and the first opened his account with a four. Hughes opted to attack and hit 3 fours in the seventh over off Bhuvneshwar Kumar as Cowan scored just five runs from the first 27 balls he faced. 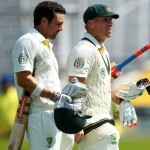 The pace of scoring was lifted by the two batsmen as they added another 3 fours in the 9th and 10th overs. Phillip Hughes was the most attacking of the two and hit 10 fours in his 45 runs but was clean bowled by Ishant Sharma for 45 off 59 balls. Shane Watson walked in next and survived a confident appeal in the 26th over as the score crossed the 100 runs mark in the 30th over. The third wicket partnership took the score to 106 as the stumps of Ed Cowan were dislodged by the off spinner Ravichandran Ashwin for 38 runs. Steven Smith joined in next with Watson who became the next victim when he was stumped smartly by the Indian skipper and wicket keeper, MS Dhoni, off Ravindra Jadeja for 17. 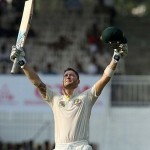 Matthew Wade multiplied the problems of the Aussies when he was caught by Murali Vijay at silly point off Ashwin for just two runs. The tourists were reeling at 7-136 in 54 overs when the tail ender, Peter Siddle, joined in with Smith who was exhibiting a lone fight at his end. The duo negotiated the dangerous spin bowling of the hosts while ticking the score board at a reasonable pace. Smith hit the first six of his innings in the 77th over as Siddle was providing him a nice support from the other side. Ravichandran Ashwin broke the smooth association for the eighth wicket at 189 in 81.2 overs when he removed Steven Smith for 46 off 145 deliveries with 2 big sixes and 3 fours. James Pattinson was the 10th batsman who took guards under trying conditions as Siddle kept on cruising with occasional boundaries. 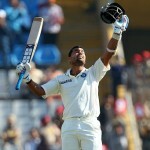 The pair survived until the last ball of the 98th over was bowled by Jadeja. The Kangaroos managed 231 runs for the loss of 8 wickets whereas Peter Siddle was batting at 47 and marching towards his maiden Test fifty as James Pattinson scored 11 runs. Ravichandran Ashwin was the star performer with four wickets whereas Ravindra Jadeja and Ishant Sharma shared two wickets each. India is still in a commanding position and Australia will anticipate at least another 50 runs from the remaining two batsmen to get them a fighting total.